At one horsepower per kilogram of weight, Peugeot is not messing around as the European automaker's return to the Pikes Peak International Hill Climb gets serious. With the Pikes Peak International Hill Climb about a month away, contenders are lining up for the historic annual event. With twists and switchbacks taking drivers from over nine thousand feet above sea level to over fourteen thousand, the race is one of both driver and vehicle endurance and stamina. Most engines lose up to thirty percent of their power due to the low oxygen at those altitudes and drivers must train to keep an even head and deep respiration to stay ahead. This year's Hill Climb sees the return of Peugeot, after a long haitus from the race. Eager to get back into the international racing scene, the Euro auto builder has set their sights on a win at Pikes Peak in the most contested category in the race, the Unlimited Class. This class allows virtually any vehicle that can pass safety inspections to vie for the King of the Peak title. To make sure that title is theirs, Peugeot Sport has gone to great lengths to hedge their bets in every way possible. To start with, they needed a pavement-burning car that can go for the long haul. An endurance racer capable of huge amounts of speed. The Peugeot 208 was a good start there. With a little (OK.. a lot of) refinement, the Peugeot 208 T16 Pikes Peak was made. Basically, Peugeot just turned to engineer Jean-Christophe Pallier and said "You have a few months before the race. Have at it." 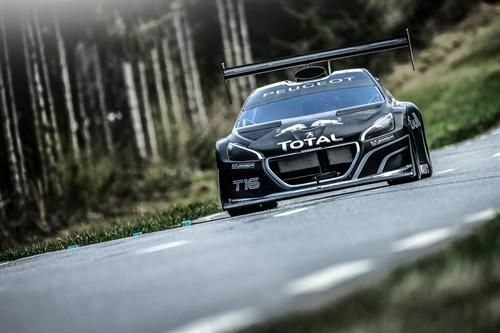 The result is the Peugeot 208 T16 Pikes Peak, an endurance GT that weighs in at 875 kilograms and boasts 875 horsepower. The throaty bi-turbo V6 was made for endurance racing, but Pallier and his team added a lot of aspiration technology to open up its lungs so it can breathe in the rarified Colorado air at altitudes over 4,000 meters. To further ensure their win, Peugeot also needed a professional, well-seasoned racer who'd be capable of piloting such a muscular little racer to the top of the hill. For that, they turned to one of the best drivers in Europe: Sebastian Loeb. It's hard to think of a better driver to take Pikes Peak in a 1:1 hp:kg machine. Add on some key sponsorships to make it all happen and viola! You have a serious contender and front-runner for the win. Of course, until the day of the race, no one knows who will truly take it. But on June 30, it's very likely you'll see Peugeot and Loeb sitting on top of the finish line holding the trophy.